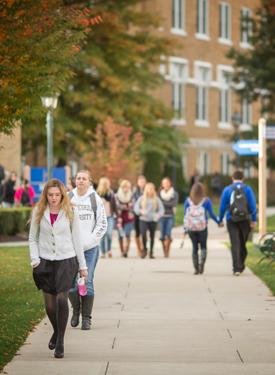 As a student at Misericordia University, you have the support of an entire campus community. From writing assistance to professional counseling, there are several resources available to ensure that you have a healthy and positive college experience. The Counseling and Psychological Services Center (CAPS Center) is located on the lower level of McGowan Hall and provides a variety of support services including individual counseling, therapy and support groups, consultation and referral services, as well as crisis intervention. Dining Services at Misericordia University are available at the John and Mary Metz Dining Hall as well as three additional locations throughout campus with a variety of convenient dine-in or take-out options. Find hours, menus, and frequently asked questions on the Dining Services page. The Office for Students with Disabilities is located within the Student Success Center on the lower level of Alumnae Hall. The Office for Students with Disabilities provides services for students seeking academic adjustments and auxiliary aids under Section 504 of the Rehabilitation Act of 1973. The Office also hosts the fee-based Alternative Learner’s Project (ALP), which provides services that extend beyond the accommodations referred to under Section 504. The Health & Wellness Center is located in the Anderson Sports and Health Center and provides students with a nursing assessment and treatment for common illnesses on a walk-in basis as well as advanced assessments by the Nurse Practitioner (by appointment only). If necessary, particularly after hours and on weekends, students are advised to seek treatment at one of the area hospitals (Geisinger Hospital or Wilkes Barre General Hospital) or at one of the local MedExpress Urgent Care Centers. The Student Success Center is located on the lower level of Alumnae Hall and provides individual academic support with general study skills and learning strategies, peer and professional tutoring, academic coaching and skill development workshops. The Writing Center is located within the Student Success Center on the lower level of Alumnae Hall and provides support to students needing assistance with academic writing assignments as well as professional correspondence such as cover letters and graduate school applications. Misericordia remains committed to recognizing the importance of a quality education while upholding strong values and honor within the community. Those values make Misericordia the perfect place to attain one's educational goals. With this mission in mind, Misericordia welcomes the men and women who have served or are currently serving our country in the U.S. Armed Forces, including spouses and dependents. Click here to view more information on veterans services.